In 1918, a new influenza virus emerged to cause a pandemic that in a two-year period about 500 million people or one-third of the world’s population became infected with this virus and at least 50 million people worldwide died – the greatest influenza mortality in recorded history. 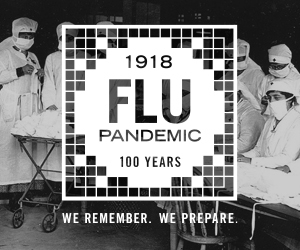 100 years later, CDC remembers the 1918 influenza pandemic and the many public health advances since that time, such as improved understanding of influenza viruses, advancements in influenza vaccines, treatments, and preparedness planning and response. CDC will commemorate the 1918 pandemic with a series of events, exhibits and activities in remembrance of the pandemic and to mark the progress that has been made in pandemic preparedness and response. This digital toolkit includes details on events/activities, sample social media and newsletter content, graphics, and web assets. All material below are available to download and share. 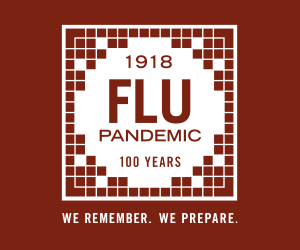 This webinar discusses the significance of the historic 1918 flu pandemic, highlight achievements made over the last 100 years to detect, prevent and respond to pandemic influenza, and discuss future opportunities to improve our pandemic influenza preparedness. Also provided are details on some special events being planned to commemorate this historic event, and share ideas and resources for your involvement. Influenza is one of the world’s greatest infectious disease challenges. But did you know that seasonal flu and pandemic flu are not the same?